To borrow the shorthand of another, more British games critic: "Yeah, it's pretty good." 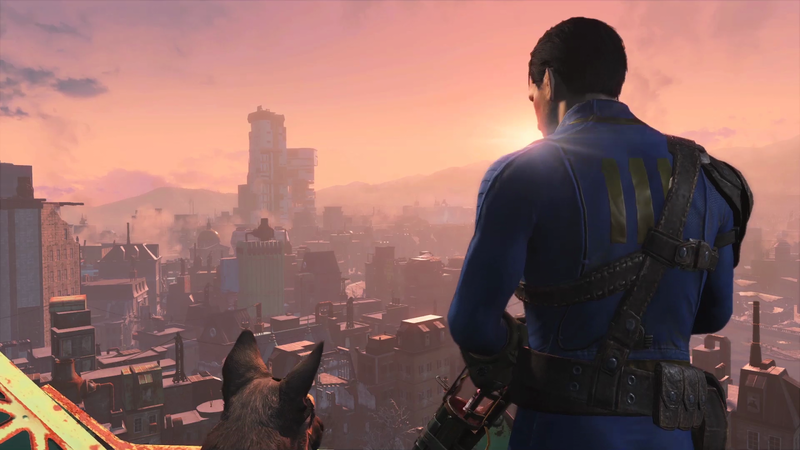 As nuclear bombs start to fall on a futuristic America, you and your spouse are shepherded to Vault 111 in Boston, one of the few underground bastions of safety left for the common people. Inside the Vault, you're cryogenically frozen in a stasis pod to awaken when the US isn't covered in nuclear waste and dead bodies. Your stay in the Vault is meant to be short-term. Unfortunately, your pod is cracked open over two centuries later, after you witness your spouse get murdered and your infant son get kidnapped by a creepy bald guy. 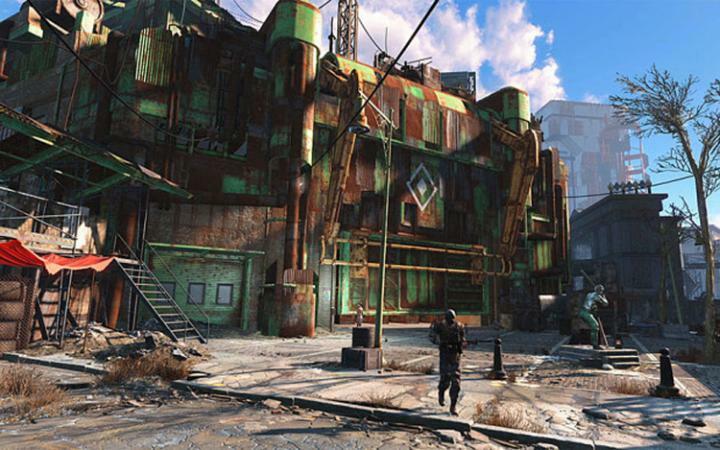 Vowing to recover your son and avenge your spouse's death, you leave the Vault and discover the thriving post-apocalyptic community of the Boston Commonwealth. Along the way you'll meet a host of fascinating side characters and get bogged down in more sidequests than an adventuring swamp monster. 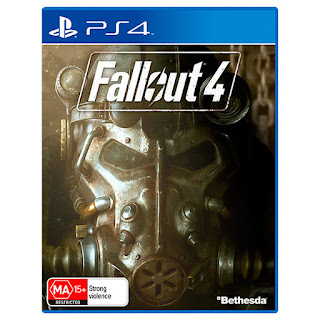 As it happens, story is one of the two major areas where Fallout 4 has made a concerted effort to stand out. 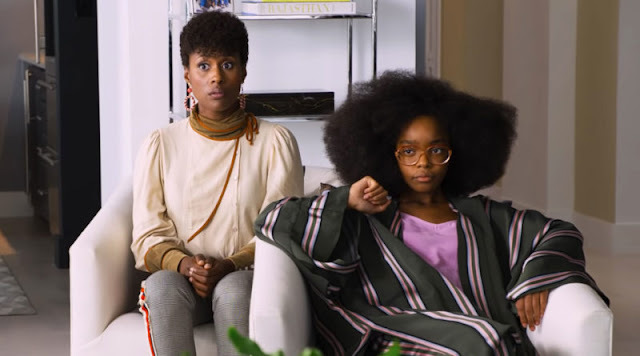 You spend time with your character and his or her loved one for a few in a pleasant future suburbia that is swiftly de-Stepforded as the bombs start to hit. As soon as you awaken, the quest to find your son takes centre stage and is constantly emphasised to every new character you meet. The addition of a voice for your protagonist (which I'll discuss more below) makes you feel more like a living, breathing character with a clearly-defined goal to attain. 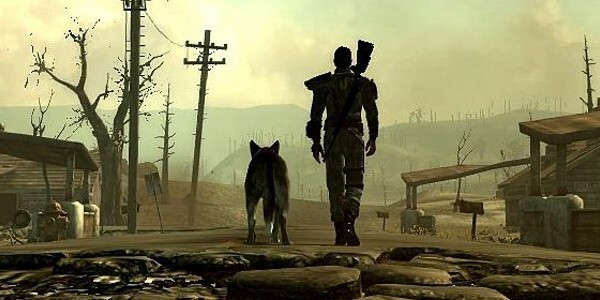 I actually enjoyed feeling more like the protagonist in my own story, as opposed to Fallout 3 (where you mostly - and literally - follow in your more-interesting father's footsteps) and New Vegas (where you're merely a pawn in the machinations of every man and his dog). There's a very strong sense of narrative throughline, making this feel more like a narrative I'm in charge of rather than merely reacting to. 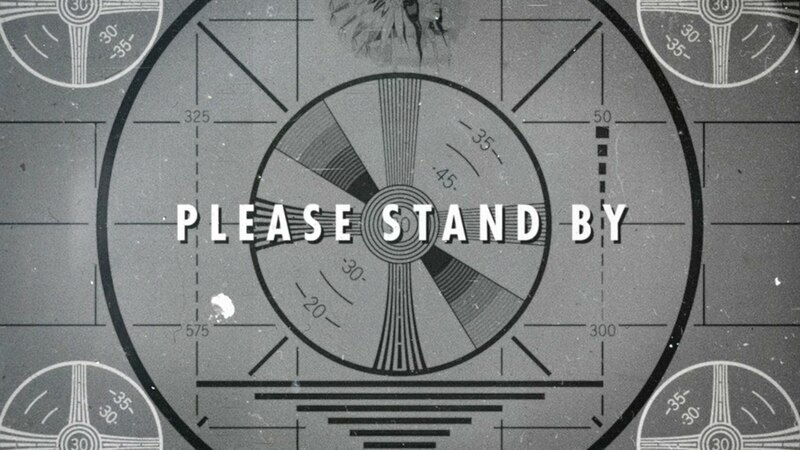 Not that the stories of previous Fallout games weren't good, but I felt a strong sense of detachment from events that didn't feel entirely story-driven with me as its protagonist. In New Vegas, especially, I played my character like a wandering yahoo who randomly stepped into all the big goings-on happening in the Nevada Wasteland. Going hand-in-hand with the tighter narrative focus is a plethora of supporting characters, both companions and otherwise, who really make the game world feel alive and distinctly lived-in. 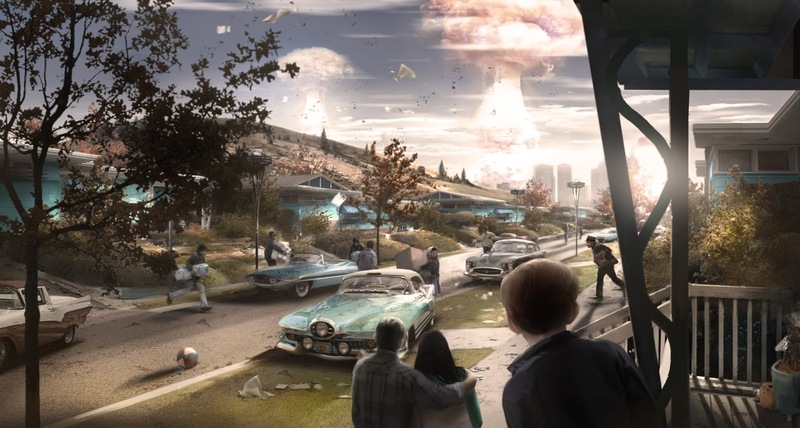 Bethesda have clearly taken some pointers from the Mass Effect school of character development and design, as most of Fallout 4's cast register as realistic and nuanced to a pleasant degree. Each of your companions have backstory and a particular way of doing things, and - in lieu of a karma meter - your actions dictate how they respond to you and the degree of influence you have over them. 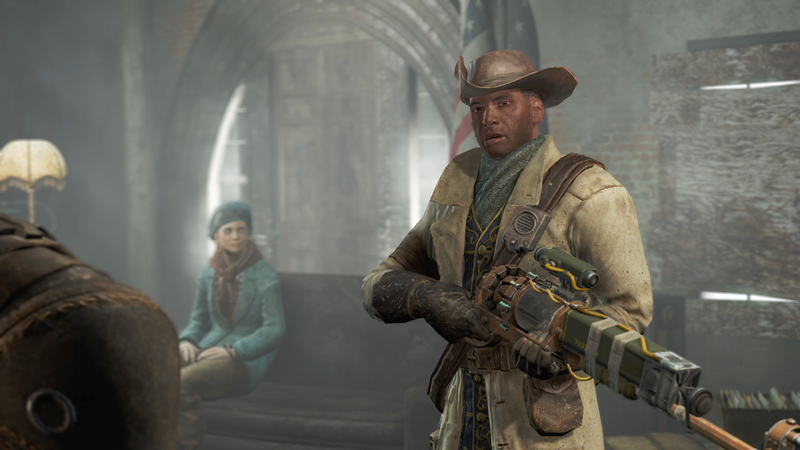 Intrepid newswoman Piper might like you helping out people in the Commonwealth, but hardboiled detective Nick Valentine may not like it if you always take the rough option when doing so. There are also a ton of dialogue options, meaning banter and character development are also in abundance. ...which is, hands down, the series' best. 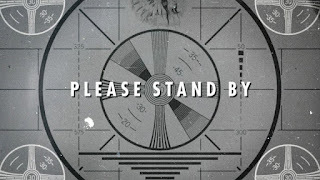 This isn't to say it's the best game ever, or that it's flawless; it's a Bethesda game, and enough floating NPCs in Skyrim have taught us that initial bugs are almost a signature of their work now. Despite the Day One glitches - which, for me, included a hilarious corpse who fell into a puddle and immediately started breakdancing uncontrollably - the developers have really taken on board Fallout's previous deficiencies and tried their best to ameliorate them. Leveling up takes a Skyrim approach, with multi-tiered perks available at certain levels with skill points you can sink into them. There's no longer a level cap, meaning that choosing which skill to gain each level is no longer a System Shock 2-style quandary of what will or will not make the game unwinnable. Shooting feels smoother and less reliant on skills spent with specific weapon proficiencies; you wanna pick up a rifle or a rocket launcher, you can go to town with either from the word go. V.A.T.S. has also been overhauled, so that your strategic "pick which limb to shoot off first" time-freeze now turns into a slow motion, bullet time-esque "pick which limb to shoot off before that limb descends upon your head" approach. It actually makes gameplay a little more hectic, challenging and fast-paced, which I'm all in favour of. That said, there is an especially sharp difficulty curve with this game. I know the wasteland is meant to be unforgiving, but it can get a bit ridiculous when high-level Super Mutants suddenly trek into the low-level area you've been blasting Radroaches in, and blow you up with one of their patented new mini-nuke-holding suicide bombers. The game prompts you to explore but be careful where you tread, lest your head go a-flyin'. 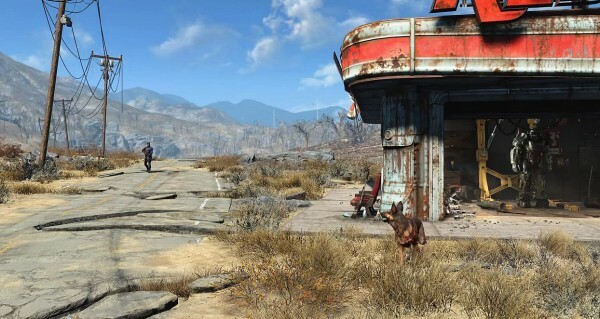 On top of the great leveling, combat and ever-present dialogue system, Fallout 4 introduces a base-building system where you can fortify settlements you're allied with. You can thus turn your starting gas station into a stronghold that'd make Fort Knox envious, as well as establish trade routes with other settlements to keep resources flowing. There are also comprehensive modding mechanics set up for guns, armour and medicine, all of which are built through raw materials. Y'know all that junk in previous Fallout game that just served as vendor trash for some quick caps? You might want to hold onto it; all of that junk can now be converted into said materials. It's the best game to play if you're a recycling enthusiast. Lastly, there's the Power Armour. You get it early on in the game, and rather than just being another, slightly clankier suit of body-protecting badassery to cart around, it's actually something closer to an Iron Man suit that regularly requires energy, or Fusion Cores, in order to function. This encourages you to not go stomping around the Commonwealth as a metal-clad herald of gruesome, post-apocalyptic death, but rather to save the Fusion Cores for when the real fights happen. That said, when you do don the Armour, it is loads of fun to go tearing around with a minigun and wrecking stuff up. It's the closest you'll get to playing a human-sized Armored Core. Not much appears to have changed from the detail-oriented backdrops of 3 and New Vegas, overall. Bethesda have clearly prioritised gameplay and story rather than making the graphics look Witcher-esque, and while a lot of others have been down on it, I don't mind it. Characters still look like they holiday in the uncanny valley, but the locations all look detailed enough that you can overlook minor quibbles like that. The addition of weather effects is welcome, with your peaceful, idyllic trip through a sunny Boston getting interrupted at any point by a hellish green radiation storm that will mess your day up like nobody's business. Despite the lack of cutting-edge graphics, there are some significant frame rate drops on the PS4 version. It happens usually when a load of enemies are all on screen at once, and after you dispatch one or two it all roughly returns to normal. It's not a dealbreaker, but I was under the impression the PS4 was given the kind of hardware that could run a spacecraft so that it could deal with multiple bodies on screen at any given moment. There's no getting around it; while I like that the protagonist is voiced now, it still feels a bit odd. Part of Fallout and The Elder Scrolls' charm is your silent conveying of dialogue through text boxes, while characters respond to you like you're actually having a chat with them. I also miss the creepy, fourth-wall-breaking eye contact they maintain while they speak at you, as the graphics have been changed to a more Mass Effect-style conversational look. I'm being facetious. The sound design is great, although a few of the characters' voices sound like the actors are kind of bored with the material. The background noise of the Commonwealth adds to the lived-in feel, with subtle sounds like bugs (of the non-killer variety) and wind movement creating a lovely aural sensation. Like The Witcher 3, this is a game that demands some nice, noise-cancelling headphones. 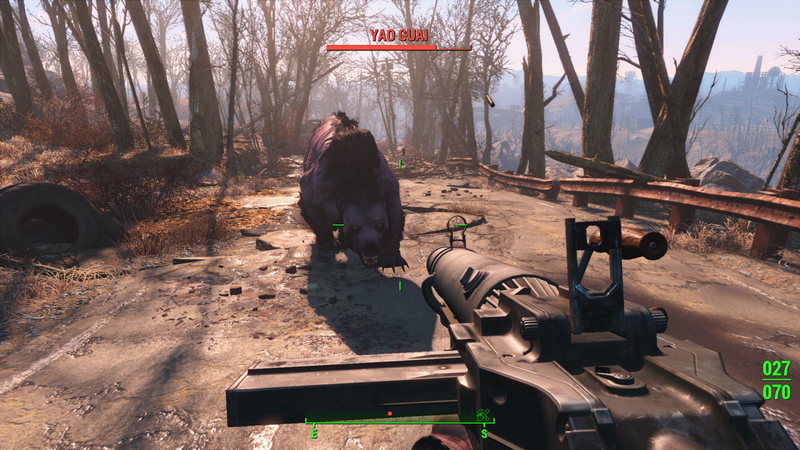 It is not perfect, nor is it the second coming of any deity, but Fallout 4 is still damn, damn good. 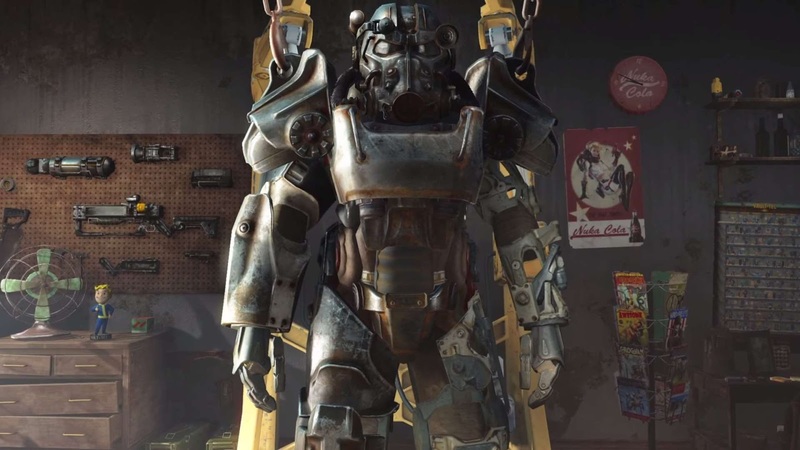 It feels great to be back in the post-apocalypse - a phrase you wouldn't think likely to be said - and Bethesda have clearly taken the seven years between this and Fallout 3, and put them to good use. It's as immersive a wasteland-trekking experience as you could ever hope to have. Just, watch out for those Super Mutant suicide bombers. Start running when you hear the beeps. 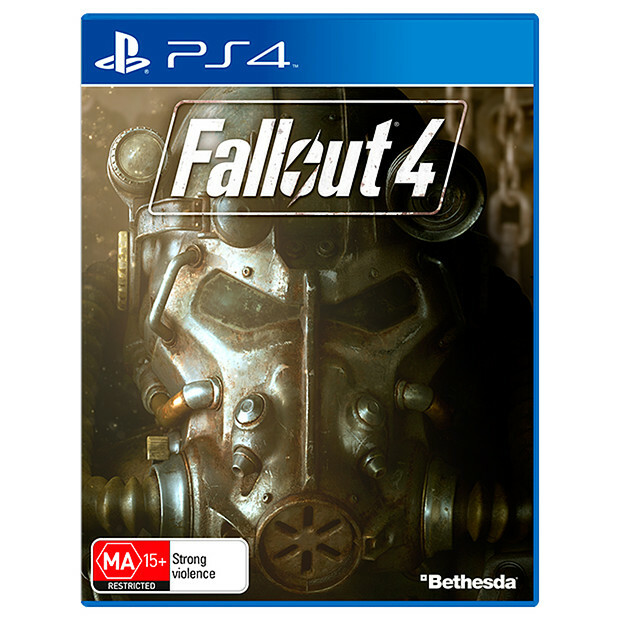 Fallout 4 is available now on PC, Playstation 4 and Xbox One.